The other morning, I was listening to my iPod on the way to work, when The Cathedrals’ “Have You Visited Heaven Lately” came across. While it is a great song, I noticed in listening that the mix was a bit shaky and Danny Funderburk’s tenor vocal is mixed very low throughout most of the song. In secular music, remixes are a fairly common occurrence. I received the newest box set from The Beach Boys for my birthday back in September (it is fantastic, by the way), and one of the big selling points of that set are the remixes on it that bring previously hidden vocals in the mix out front, or to make different instruments more prominent. Why couldn’t Southern Gospel do this? It would open up the market for compilations greatly. I think that the basic formula that is used by The Beach Boys would work well for Southern Gospel projects. The Beach Boys use a team of three respected producers/engineers that are also fans of the group, and those three guys are responsible for actually doing the remixes, then the final product is approved by the group, whether it is a greatest hits type compilation, a complete album remix, or a large boxed set. This could work well in Southern Gospel. For example, I’d love to hear what Garry Jones and Ricky Free could do with classic Gold City songs or albums. Imagine Jones and Michael English or David Phelps tackling The Cathedrals, or Madison Easter and Michael Sykes remixing classic Oak Ridge Boys material. The advantage here is that the artist doesn’t have a huge commitment other than giving a thumbs up to the final product, and the actual work becomes a labor of love for qualified, talented people who are fans of the group they are working with anyways. That’s a key point, but it works. The biggest obstacle? While the owners of the masters for these projects aren’t the ones doing the remixing, nearly all of these masters were recorded to analog tape, which means they would have to be digitally converted, which could be a time consuming and potentially expensive proposition, before they were turned over to the engineers for remixing. Still, I think this could be a pretty successful venture. Who wouldn’t want to hear restored and remixed versions of classics by the Statesmen or the Blackwood Brothers? I’d love to hear a tighter mix of “Have You Visited” that smooths out the blend and brings what sounds like a great high vocal from Danny Funderburk out front so it can be better heard. Who is willing to take the first step? Released in 1972 at the height of the Oak Ridge Boys’ popularity in Southern Gospel music, this is a live album made up mostly of songs from the International LP. Personnel on this album are Willie Wynn – Tenor, Duane Allen – Lead, William Lee Golden – Baritone, Noel Fox – Bass, Tommy Fairchild – Piano, Mark Ellerbee – Drums, Don Breland – Bass Guitar. Jesus Walked All The Way – This is a uptempo tune that really gets the concert started off right. There’s a nice trio with Allen, Golden, and Fox on the second verse before Wynn takes the lead on the chorus. Noel Fox really shines on his step out line in the chorus. A repeat of the chorus after a key change and tag end a short, but great track. The Coming Of The Lord – This is another great track. It’s a more midtempo cut that features Noel Fox on the first verse before Duane Allen takes the melody on the chorus. Fox had a terrific bass voice, with smoothness and range both. William Golden sings the second verse. There’s a key change that if my ears don’t deceive me goes up a whole step instead of the more typical half step and a repeat of the chorus leading to a tag. Paid In Full did a really nice cover of this song a few years back that was pretty true to the Oaks’ arrangement here. The Holy Hills Of Heaven Call Me – This one will likely make it into my “Definitives” series as Duane Allen and the rest of the quartet really shine on this Dottie Rambo classic. It’s always interesting to hear recordings of these classic songs from when they were new. It’s a tremendous performance, and I love the walking bass guitar line on the beginning of the second verse. Classic Oak Ridge Boys. He Did It All For Me – This may be my favorite ballad done by the Oak Ridge Boys. After group vocals on the first verse, the key modulates up, the tempo slows and Duane Allen proceeds to sing the absolute fire out of the second verse. The key changes again and Willie Wynn takes the melody leading into the chorus. Duane and Willie trade off the melody and build to a high power tag. After a testimony from Duane, they encore the song starting with the second verse. Wow. A true highlight of the album. Heaven – The second side of the LP starts off with this classic tune. I love the way Duane Allen introduces this song by saying “We might not do it too good, but we don’t know it too loud yet.” There is a scorching hot piano introduction from Tommy Fairchild that is one of my all time favorite intros. Allen takes the melody with the other 3 vocals arranged like a male trio behind Allen’s ad libbed lead vocal. Fairchild gets a chance to repeat his intro work as a break in the middle of the song. This song is the early 70s Oaks in their comfort zone, and this song packs quite a punch. You’ll Never Walk Alone – It’s amazing how long this song stayed a part of the Oaks’ repertoire, as this was the title cut to an early 60s Skylite album from the group. In fact, Willie Wynn is the only vocalist on this version who also recorded the previous version. Duane Allen again takes the lead and it’s a very nice performance of the inspirational classic. 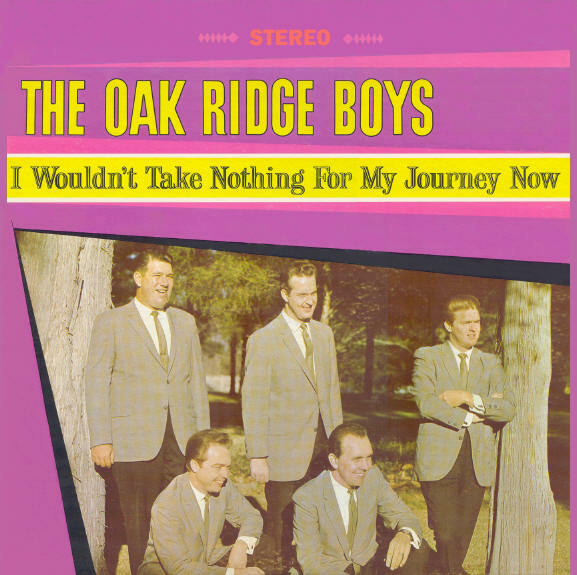 I Wish We’d All Been Ready – Larry Norman’s classic song that was one of the first hits in what would later become Contemporary Christian Music gets covered here by the Oaks. It’s a unique performance in that the Oaks’ drummer, Mark Ellerbee, lends his lead vocals to the song, with fairly sparse backing vocals from the rest of the quartet on the last chorus. Ellerbee’s vocal style lends itself very well to this song. It was obviously a hit with the audience. Jesus Is Coming Soon – In what will be another “Definitive” performance, Duane Allen launches straight into his solo second verse on what was a monster hit for the group around this time, and it’s obvious by the crowd’s reaction. There’s a different rhythm on this performance of the song, that I’ve never heard duplicated, but is absolutely the best instrumental arrangement I’ve ever heard of the song. Willie Wynn shatters glass on the ending of the song. It’s only about a minute of actual singing time, but wow, what a performance in a concentrated performance. I Know – Another current monster smash for the group at the time, the album closes out with one of the group’s best known songs. Duane Allen has a hard time getting the song started from the crowd response to the first line. The crowd goes wild for the song and again the group has to encore it. It’s a great way to end the concert. Summary: While The Kingsmen are typically recognized as the kings (pun intended, of course) of the live album, when a list is made of the greatest Southern Gospel live albums of all time, this album deserves a spot in the top 10, if not the top 5. It’s an enthralling capture of one of the most popular groups in the history of the genre at the height of their popularity. The performances are all high energy, and the intensity is such that you don’t realize there are only 9 tracks on the album, or that “Jesus Is Coming Soon” is such an abbreviated version. The Oaks hook you in from the first few notes of “Jesus Walked All The Way”, and you don’t feel like you can hardly catch a breath until the final cutoff on the encore to “I Know.” One thing that I mentioned briefly in the comments on “Heaven” but that I wanted to be sure to highlight is Tommy Fairchild’s piano playing. He is an absolute wizard on the piano on this album, and displays just the right touch and the sense of when to “show out” with some nice piano licks and when to stay subdued and give the vocals the spotlight. This album would be SG Piano Accompaniment 101 Exhibit A. It really is a masterful job. I looked long and hard for this album. 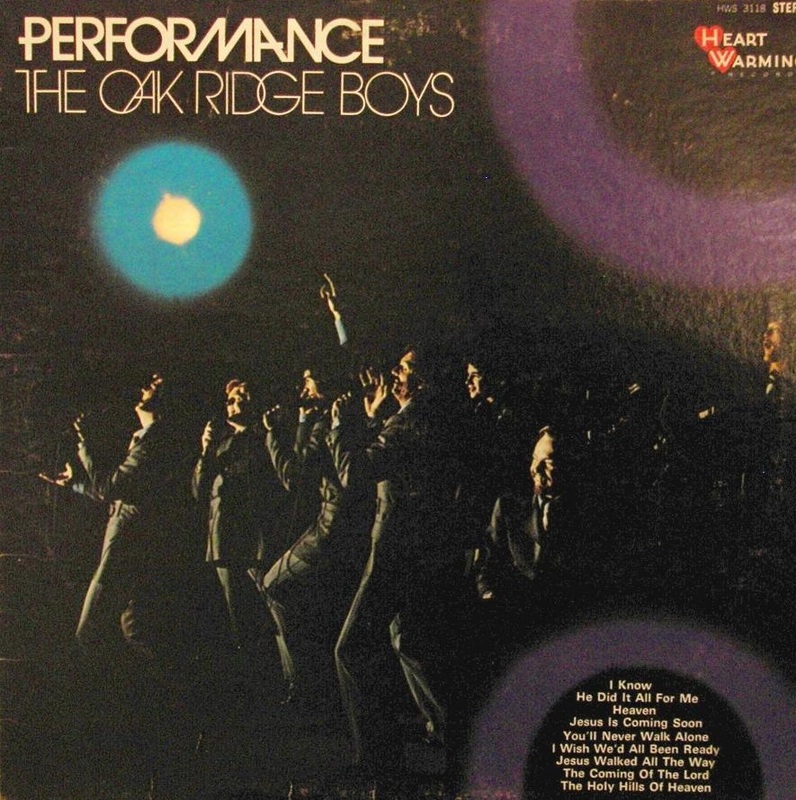 Growing up listening to my dad’s LPs, he would always mention this “incredible live album from the Oak Ridge Boys called Performance” and said it had the best version of “Jesus Is Coming Soon” that he’d ever heard. He had a copy, but it had been lost or borrowed on a permanent basis long before I was old enough to listen to it. I was absolutely thrilled the day I finally located a copy as a college student, and I will never forget putting needle to vinyl for the first time after having heard so much about this LP growing up. All I can say is this: Dad was right. My first post of this series dealt with one of the classic ballads in SG. Now let’s tackle one of the quintessential uptempo numbers in our genre. Of course this song will be forever associated with The Happy Goodmans, but my choice for the definitive version of this tune goes back to a 1964 Skylite album by the Oak Ridge Boys. Personnel on this album were Willie Wynn – Tenor, Smitty Gatlin – Lead, Jim Hamill – Baritone, Herman Harper – Bass, and Tommy Fairchild – Piano. The song starts off with an electric guitar playing some lead lines over piano, bass and drums before leading into the chorus. The first verse is performed by Smitty Gatlin, and after the chorus Herman Harper takes the second verse as a bass solo. There’s a little instrumental break with the electric guitar featured again before the key changes and Willie Wynn takes the lead for two final choruses and a high power tag. To me, this is the feel that the song needs. It’s sped up a bit from the Goodmans version, and becomes a great, male quartet barn burner. Smitty Gatlin and Herman Harper are two of our largely forgotten, but very talented vocalists in the history of Southern Gospel. Both get an opportunity to shine on this song and make the best of it. If you’ve got this LP, spin up track one, and then let the thing play. I’ve always thought this was a great quartet LP, and the title track starts it off in fine fashion. No one has done it better. According to a post on his Facebook page last night, Willie Wynn was informed that he is going to be inducted into the SGMA Hall of Fame this year. Wynn was the longtime tenor for the Oak Ridge Quartet/Oak Ridge Boys. He was featured on several of their hits, songs like “I Know” and “Jesus Is Coming Soon”. I’m glad to see “Little Willie” honored, he was an integral part in the phenomenon that was the Oak Ridge Boys. Growing up with my dad’s SG record collection, I’ve spent many an hour with the sound of his trademark tenor voice emanating from my speakers. Congratulations Willie! UPDATE: Daniel Mount has the complete list of inductees here. The nominees for the 2011 Dove Awards were announced today. Below is a run down of relevant SG nominations (SG nominees italicized). I’ve yet to see the nominations online for the Southern/Country song and album, so I will update with those as soon as I can find them. It’s great to see some SG talent being recognized in the multi-genre categories, such as Jason Crabb and Doug Anderson up in the male vocalist category, Janet Paschal in the female vocalist, and Triumphant Quartet in Song of the Year. Best of luck to all the SG nominees. First of all, I will apologize for my lack of posting lately. My family and I are in the process of buying a new home, which is taking up a lot of my former blogging time. We close in about a month on our new home, so my blogging time is going to be sporadic between now and then. I’ve got some things in the works, I just haven’t had the time to devote to them that I’d like. Stick with me, I’ll do my best to keep things going, and of course anything major that comes down the pipe I’ll be sure to post and comment on, but the weeks following NQC are typically fairly slow anyways. 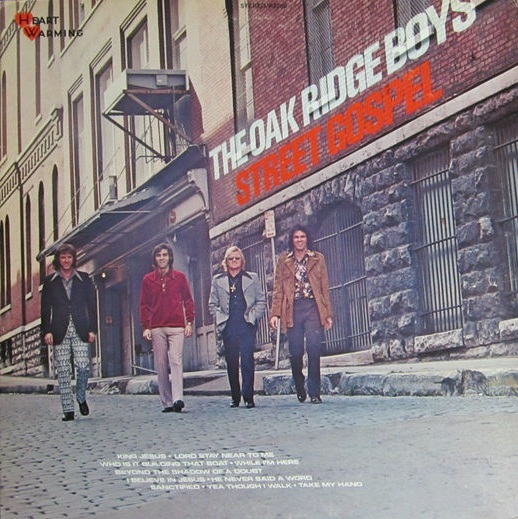 This gem comes from the Oak Ridge Boys 1973 LP Street Gospel LP, which was the last full album to feature Willie Wynn as the tenor, along with Duane Allen on lead, William Lee Golden on baritone, and Richard Sterban on bass. William Golden has the lead on the song, with Duane Allen switching down to the baritone part. The verses are done in a syncopated rhythm with a progressive (for the era) feel. The chorus smooths out the rhythm to a typical SG feel complete with the entrance of a banjo. Golden sings the verses solo, with the rest of the quartet entering for the chorus. Folks who are only familiar with the Oaks from their country days or their Gaither appearances will be surprised by Golden’s upper range that is displayed on this song, as he sings the song in a typical lead range. The second chorus is repeated before a tag that has the other members of the quartet chanting “Right now” and inverting the harmony up a couple times while Golden ad libs variations of “He’s here right now…” Buried as the last track on side 1 of the LP, this song could be overlooked very easily, but it’s performed very well, and is a very enjoyable tune. This would make a great cut on a table project, and Gold City or Triumphant could do very well with it, with Daniel Riley or Scotty Inman taking Golden’s verses. I’d love to hear someone bring it back.